You dog's city registration is his ticket home should he ever become lost! 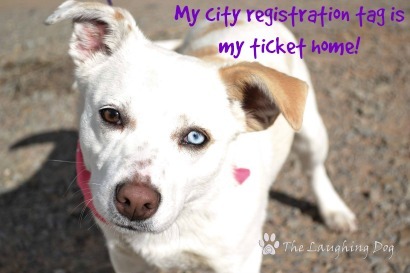 You may register your dog at City Hall or print the Dog Registration Application and return by mail with your payment. Along with the application, we also need a copy of your dog's Rabies Vaccination Certificate from your veterinarian. The cost is just $8 for spayed or neutered dogs and $10 for intact dogs. The fee includes a tag for their collar to provide easy identification. Reuniting lost dogs with their owners. Helps veterinarians and Animal Control Officers contact you should your pet ever become injured and need life saving treatment. Helps keep strays off the streets. Helps maintain good health of our citizens and pet population by monitoring required vaccinations.